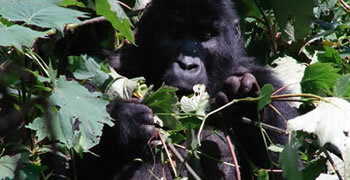 Bwindi National park is situated in the southwestern part of the country. 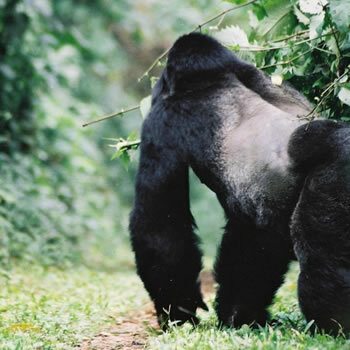 Bwindi Forest is the home of the Mountain gorillas that are considered by UNESCO as one of few survivors of the ice age period. The forest is very thick with talk trees that form a very dense canopy at the top. The Guide this morning will pick you from your hotel in Kampala or Entebbe and the drive you to the park. Enjoy your lunch enroute and carry on passing the undulating hills of Kisoro. Arrive late in the evening and enjoy your dinner and overnight at: Gorilla Resort camp/ Bwindi Veiw Lodge / lake Kintandara camp/Buhoma community Bandas. After a morning breakfast, head to the park headquarters for briefing with your tracking gears and packed food. You are require to put on long trousers because there are stinging nestles in the forest. You will later be briefed by the guide who will lead you into the forest to start searching for the huge apes. The time you take to find these apes is very unpredictable and but you will be entertained by other apes like baboons, vervet monkeys, red tailed monkeys, grey tailed mangabey, black and white colobus monkeys and so many others. In case you are not so tied, take an optional community walk to the Batwa land and later return to the lodge for dinner and overnight. Dinner and overnight at the lodge of your choice. This morning you will to return to Kampala to catch up with your flight back home.